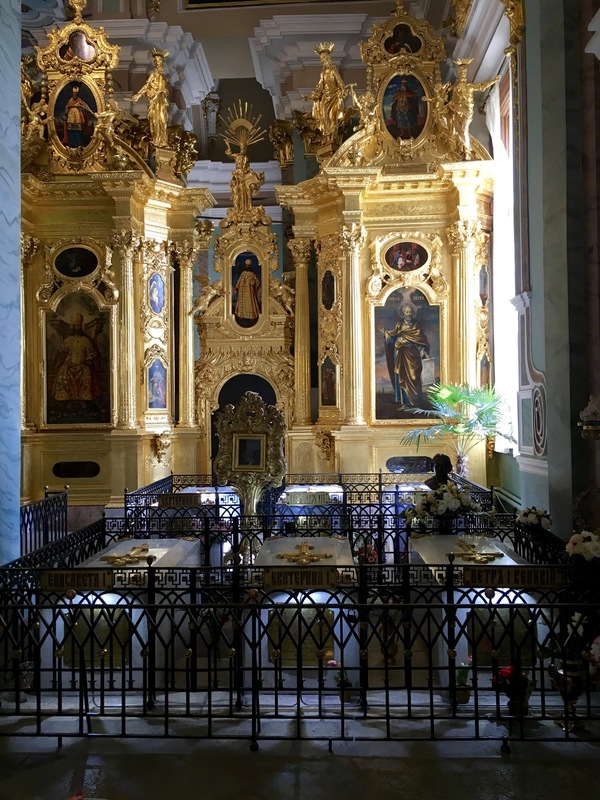 St. Petersburg was founded in 1703 in a swampy area on the eastern shore of the Gulf of Finland by Peter Alexeyevich of the house of Romanov, Tsar of Russia, known to history as Peter the Great (1672-1725). 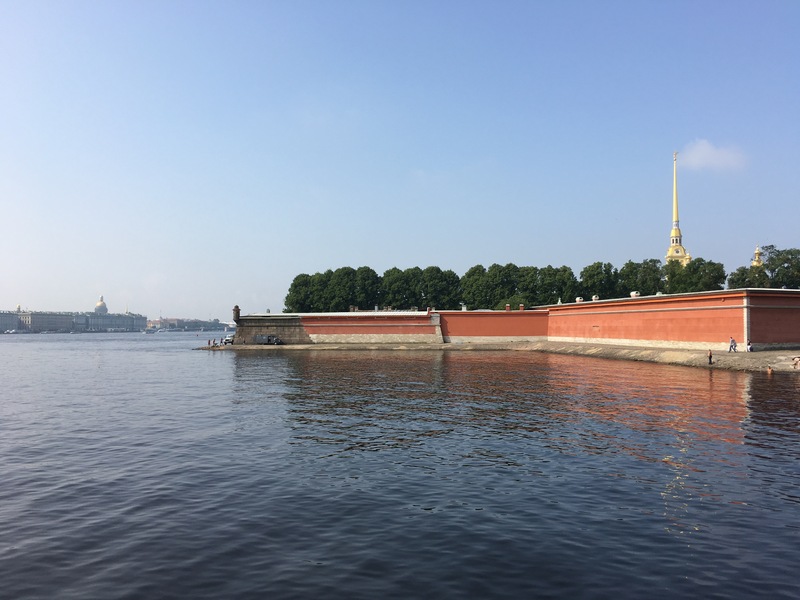 To defend his new city from the Swedes, with whom he was at war from 1700 to 1721 in what came to be known as the Great Northern War, Tsar Peter built a citadel, later named the Peter and Paul Fortress, on a small island on the north bank of the Neva River. 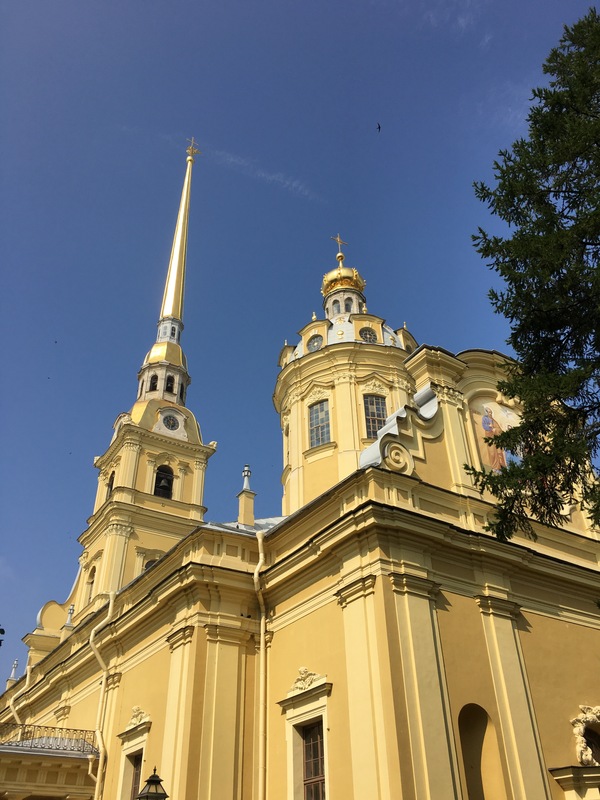 In 1712, St. Petersburg was made the capital of Russia and that same year the construction of a great cathedral commenced within the fortress, the Saints Peter and Paul Cathedral; it’s the tall, golden spire on the right in the photo, below. In 1722, after the Tsar’s forces had defeated the Swedes in the Great Northern War, Peter the Great, whose rule now extended to lands taken from Sweden (including Livonia, present-day Estonia and Latvia), declared himself Emperor of a new Russian Empire. According to its website, the Peter and Paul Fortress and Cathedral are closed on Wednesdays, but we could see people in and around the fortress on our walk across the Trinity bridge (Troitskiy most) on our way to the State Museum of the Political History of Russia, so we took a chance and were surprised to find the main gate, St. Peter’s Gate, open. 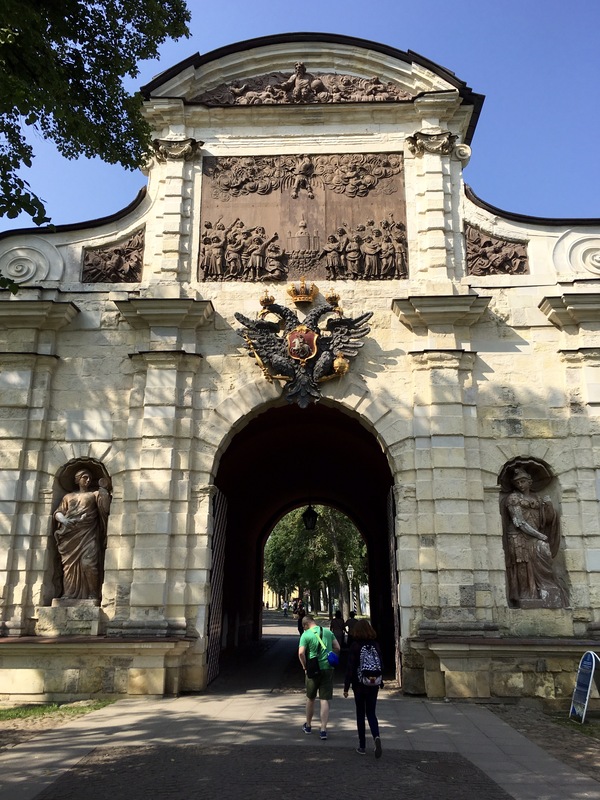 Notice the double-headed eagle on the crest above the door in the photo, below; that’s the Romanov Tsars’ coat-of-arms.We’ve seen it all over Moscow and St. Petersburg. 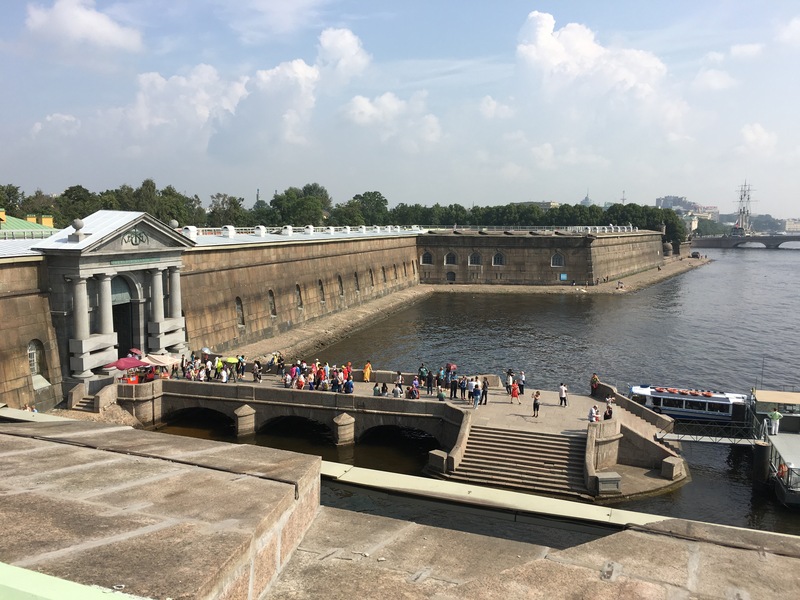 Here’s the view from the bastion looking across the Neva River at the Winter Palace on the other bank; it’s an important scene, for reasons that I’ll explain, below. WARNING: If you’re not interested in the history of this place, you can stop reading here. The Romanovs ruled Russia from the time of Peter the Great until Tsar Nicholas II abdicated the throne during the Russian Revolution of 1917. At the start of WWI in 1914, Russia had sided with the Allies (France, Great Britain, Italy and the United States) against the Central Powers (Germany, Austria-Hungary and Turkey), but things went poorly for the Russians from the start. By 1917, Tsar Nicholas had decided to take control of the military himself and departed for the front, leaving his wife, Tsarina Alexandra, to rule the country in his absence. Unfortunately, she was a little nutty, in addition to being a poor ruler. Even more unfortunately, most of the food and basic life necessities had to be shipped west to support the army in the field, creating shortages for the folks back home. In February 1917, the workers and housewives in St. Petersburg rebelled against Tsar Nicholas II, who was convinced to abdicate the throne. The Duma, a legislative body created in 1905 to quell an earlier rebellion, appointed a committee known as the Provisional Government to take power. But the populace was not pacified and through committees of workers and soldiers called “soviets,” a parallel Soviet government came into being. Throughout the summer of 1917, the Provisional Government and the Soviet government wrangled over power while a power struggle also ensued within the Soviet government between the Bolshevik (“majority”) party and the Menshevik (“minority”) party. Ultimately, in October 1917 (it was actually in November, but the Russians used a different calendaring system then, so we’ll just stick with October), at the urging of Vladimir Lenin and other Bolsheviks, the people again staged a revolt – this time to overthrow the Provisional Government, the senior officials of which had by now barricaded themselves in the Winter Palace with an inadequate military guard. The Bolsheviks planned well, capturing all strategic locations early on, thereby isolating the Provisional Government in the Winter Palace, incommunicado. 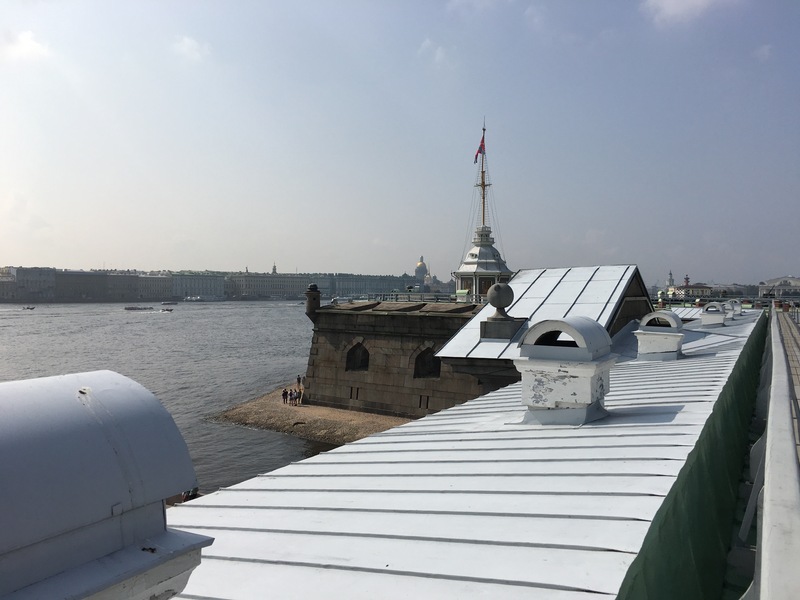 On the night of October 25, 1917, a warning shot was fired from the Cruiser Aurora which was anchored in the Neva River and (according to some sources) 30 shots were fired at the Winter Palace from the Peter and Paul Fortress, two of which caused minor damage while the rest either missed their mark or were never intended to hit it in the first place. 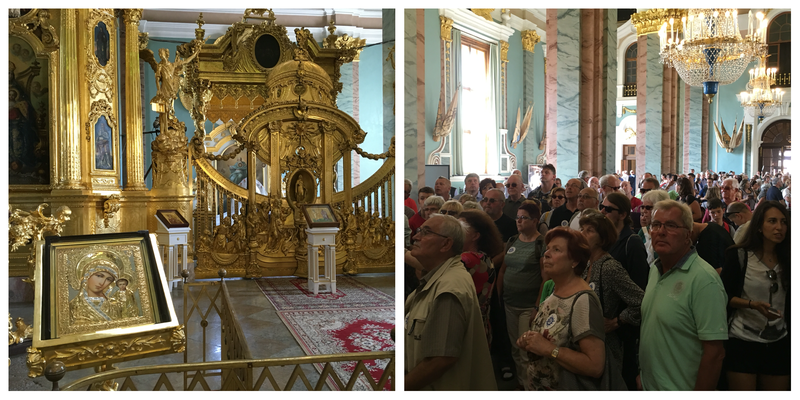 At any rate, one of the doors to the Winter Palace was left open, so the Bolshevik forces were able to enter the Winter Palace without firing a shot, where they captured most of the officials of the Provisional Government, imprisoning them in the fortress. Thus, the Soviets took power in Russia in “Red October” of 1917. This is not the end of the story, however. A civil war ensued between the “Whites” who had been thrown out (and were now supported by the Allies) and the “Reds” (the Bolsheviks) who were now in charge. In 1918, in order to consolidate power, the Bolsheviks (now calling themselves “Communists”) entered into a treaty with the Central Powers and exited WWI, agreeing to abandon the lands they had occupied up to that point, including Estonia, Latvia and Lithuania which thereby gained their independence. Oh, and for good measure, the Bolsheviks/Communists also assasinated Tsar Nicholas II, Tsarina Alexandra and their kids. The Russian Civil War continued for two years until the Communists’ Red Army prevailed in 1920. By now, the Communists called their country the Russian Soviet Federated Socialist Republic, although the Soviets had little to do with governing any more. Now it was the Communist Party that was in charge and at its head was a single individual: Vladimir Lenin (1870-1924). On December 30, 1922, the Russian and Transcaucasian Soviet Federated Socialist Republics united with the Ukrainian and Belorussian Socialist Republics to form the Union of Soviet Socialist Republics, the U.S.S.R.
Vladimir Lenin died in 1924 and St. Petersburg was renamed “Leningrad” that year in his honor, the name by which the city was known until the dissolution of the U.S.S.R. in 1991, when the name reverted to St. Petersburg (between 1914 and 1924 the city was called Petrograd, in place of the more German-sounding, St. Petersburg). It was left to Lenin’s successors, namely, Joseph Stalin, to turn the U.S.S.R. into a world power, though it costs millions of people their lives to do so.